Before I introduce the new features of Planet Hunters Talk 2.0, I wanted to give an update of what happened to the original Planet Hunters Talk. The original Planet Hunters talk is still online at http://oldtalk.planethunters.org, and you’ll find a link to it on the navigation bar of the New Talk. The original Talk is a repository of discussions and discoveries, and we’re not taking it offline or shutting it down. You can still log in and post there. The differences in how stars are treated between the two versions and the sheer volume of interconnected discussions and comments makes it very difficult and time consuming to attempt to migrate that content to Talk 2.0. There’s a very real chance we could do this incorrectly, so we thought the safest option was to leave the original Planet Hunters Talk online as resource and with all light curves shown from Planet Hunters 2.0 going to the new Talk. There are a few key differences between new Planet Hunters Talk and the original version. Firstly how we treat the stars is different. On the original Planet Hunters Talk, we treated each 30-day light curve section shown in the classification interface as a different entry in Talk with its own page, where people could leave 140 character comments and start side conversations. So a single star would have many discussions spread across different light curve Talk pages with no easy way to tell that someone had posted a comment about a different quarter. 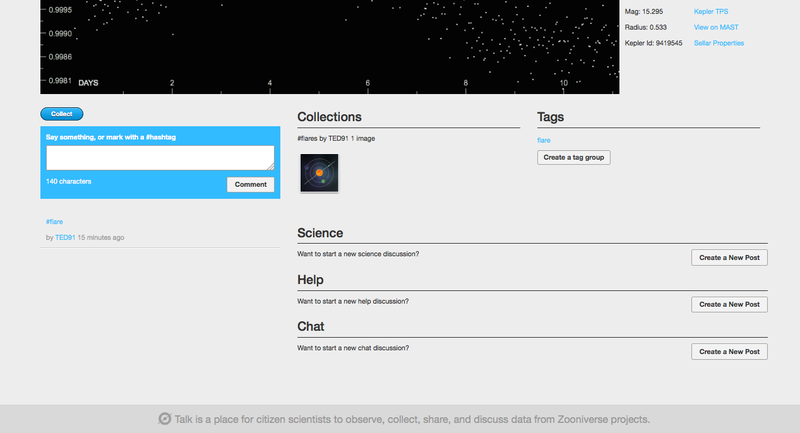 In the new version of Talk, we give each star a Talk page (with the APH ID representing the Planet Hunters ID for the star) so comments and conversations are grouped together from people who see the different light curves chunks from the star. 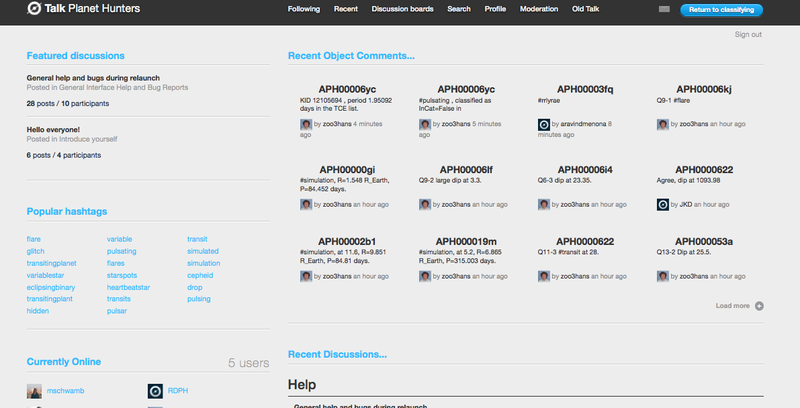 Below is an example of a Talk page for star APH0000622 (http://talk.planethunters.org/#/subjects/APH0000622). Here you’ll be presented with a light curve viewer for the star with all available quarters of Kepler data for this star to peruse through (if you enter this page from the main classification interface the light curve chunk you reviewed in the classification interface will be automatically loaded in the light curve window). Later in the future, we plan to add scrolling and zooming capability to the light curve viewer. In addition we list the Kepler id for the star, and any other information we have for the star (like radius and temperature) and some useful links which we’ll describe in more detail in another blog post.Like original Talk, you can make collections, write 140 character comments, add hashtags, and have longer side discussions about the star and the light curve you reviewed. Just like old Talk, if you have more to say than 140 characters there’s the ability in New Talk to start and have longer side discussions about the star. The difference is that now you have to select which topic, Help, Science or Chat your discussion will be about it and then click on the Post button to start the discussion. this is because the discussion is also linked and archived for easy access on the Discussion Boards (more about this in the next section). New Talk has discussion boards (which you can navigate to with the top bar by clicking on Discussion Boards) like original Talk in three categories: Help, Science, and Chat. The main difference is there are now subboards under each of these three headings where you can post and start discussion threads. You’ll notice that each of the three board categories has an ‘The Objects’ subboard. This is where you can also access the side discussions you make on the star Talk pages. 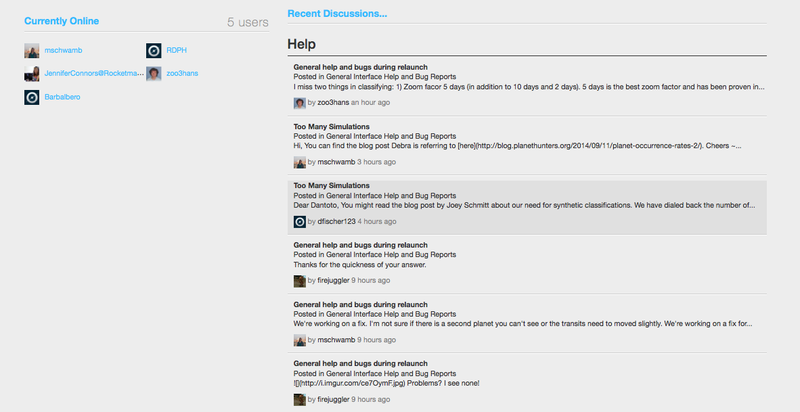 They get linked and archived here for so they’re easy to find by the Planet Hunters community and the science team. In the old version of Talk a side discussions were often buried and hard to get to. Now you can quickly check out each ‘The Objects” board and see what longer discussions people were having about a given star. The font page of Talk accessible when you go directly to http://talk.planethunters.org ( or by clicking on the Recent tab in Talk) lists the most recent 140 character comments made on Talk as well as displays the latest comments in the discussion board threads for easy access. By clicking on the comment, you’ll get taken to the Talk page for the given star. By clicking on the discussion board post, will take you to directly to that thread. 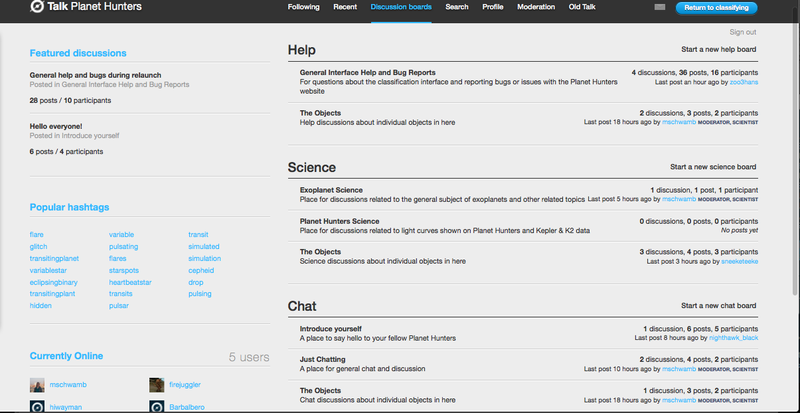 You can either go directly to the Talk website by url – http://talk.planethunters.org or you can access Talk through the main Planet Hunters classification interface. Once your classification for a light curve is submitted in the main interface, a summary page appears (see below). Here you can directly write a 140 character comment about the light curve you saw (that will appear on the star’s Talk page) without leaving the classification interface. If you click ‘Discuss on Talk’ you’ll be brought to the Talk page for the star with the light curve chunk you reviewed queued up in the light curve viewer. Direct/private messages on New Talk are a little different that has been done in the past for Planet Hunters. You won’t get an email when someone sends you a private message, instead the envelope icon on the top right of the navigation bar (by the return to classifying button) will tell if you have any unread messages. If you have an new unread message, the envelope will brighten and the number of unread messages will be listed. Clicking on the envelope or the Profile tab will take you to your list of messages. We wanted to get to the new interface out to you as fast as we could so that we’ll be ready for the K2 data which we’re currently processing and placing in a format the new interface can read in. There are some small finishing touches the Zooniverse developers will be adding in the coming days to new Planet Hunters Talk. Thanks for your patience as we go through these small growing pains with the project. If you have suggestions of features you would like to see in Talk, please post your ideas in this thread, and we’ll try our best to accommodate those requests. The Planet Hunters Talk moderators (TonyJHoffman, constovich, and echo-lily-mai) are standing by ready and willing to help. So if you’ve got a question about the new Planet Hunters or Talk don’t hesitate to ask them. Thanks for this update guys. I’m sure I’ll get used to working the various links as time goes by, it’s just that I’m having problems simply going from one star classification to another new one. I only begun yesterday, so I’ll keep trying using this blog as a guide. Please for the love for all science, fix your simulation system. Simply put, your simulation system is broken. There is no checking mechanism to determine if the simulation is a good one or not. Attached (to a message I sent you guys on FaceBook) are a variety of images collected by a very dedicated friend of mine who was willing to go through this program of yours for far longer than I had the patience to stick with. I tried, I seriously tried to stick with it for an hour or so … but when I kept on missing the simulations (I guess to test if I was any good at finding transits) because they were essentially invisible, I gave up. If you want people to help you do science for free, at least give them a program that works.